Distinctive features: The white flowers are among the first to bloom in the spring. Mottled small pointy leaves. 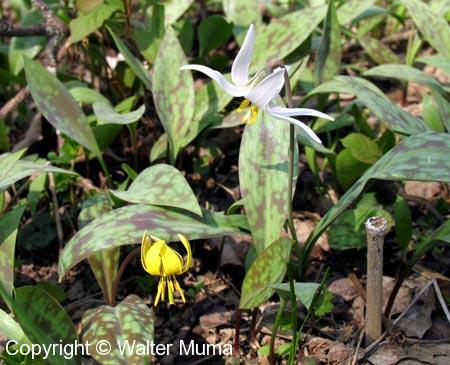  Trout Lily (Erythronium americanum) - Yellow flowers, similar habitat. Flowers: Spring; White; 6 parts (petals); Solitary white nodding flowers. Very photogenic! Leaves: One or two per plant. Stiff, upright, 3-8" long. Mottled like a trout fish skin (hence the name). Stem: None, except for the flower: smooth. Fruit/Seeds: In a capsule, maturing as the rest of the plant dies off. Lifespan: Perennial. Disappears by early summer, to reappear the next spring. Edible: The corms (tubers) are edible raw. Status: Relatively rare: not as common as the yellow-flowered. Notes: These are extremely photogenic plants that dapple the early spring woods with their beautiful flowers. Photographs: 137 photographs available, of which 8 are featured on this page. SCROLL DOWN FOR PHOTOGRAPHS. 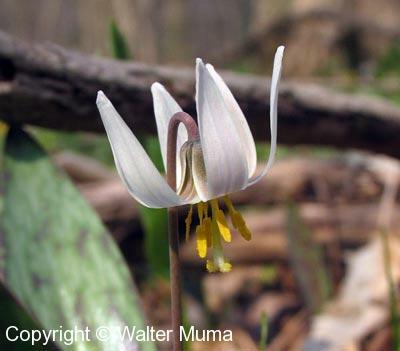 The beautiful White Trout Lily flower! 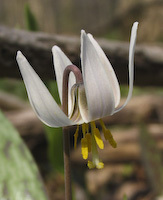 Here is a "regular" Trout Lily with a White Trout Lily nearby. As you can see, they are essentially the same, except for the colour of their flowers. The two species generally like the same habitat. 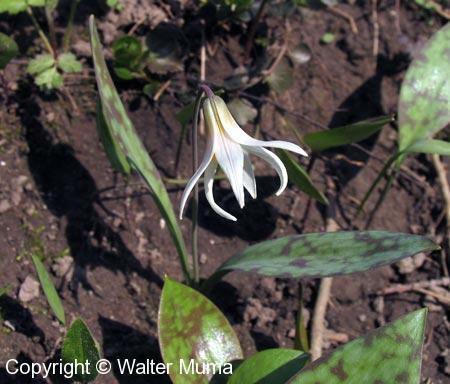 However, the White Trout Lily is much less common than the yellow species. A partially opened flower. Very "graceful" looking. 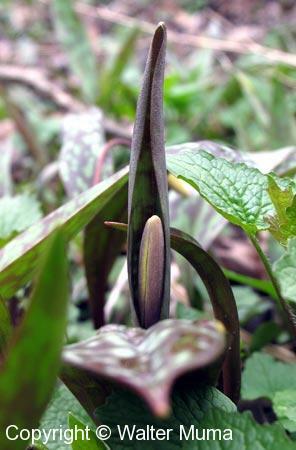 A White Trout Lily flower bud just emerging from its protective sheath of leaves.